I’m looking for a RUSS Baby No. 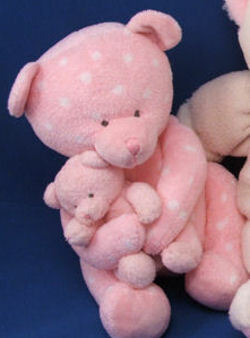 21828 pink velour with white polka dots Mama Bear with Velcro holding her Baby Bear, named TICKLES. If you press Baby it plays BRAHMS LULLABY. My daughter received one when she was a baby. It’s her favorite bear, and she lost it at the mall.